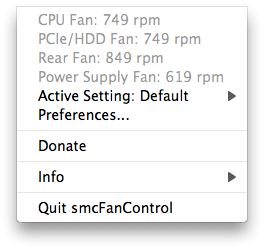 A New Mac Tip Every Day: Controlling the minimum speed of fans! I have a different fan-related problem. My fan goes up and down like a roller coaster. Every few minutes it revs up very high and loud and stays up for 10 to 30 seconds and spins back down. How hot is too hot? Apple support just sent me to support docs that were inconclusive. To clarify, greater processing requirements cause higher hardware temperatures, does this directly effect performance? As referenced, graphics intensive apps such as Motion cause processors to heat up, and I've experienced slower performance after working in Motion for extended periods, especially moving back and forth between Motion and FCP. Do warmer processors perform worse? ...using a 2.0 gHz Intel iMac. My fan problem is also different ... the fan on my intel MAC shifts into high gear right after I turn it on or wake it from sleep. It stays in high gear until I put it back to sleep or shut down. It's not a greater processing requirement but it sure is a noise issue. I tried the MAC posts but haven't found the answer. Anybody know? I prefer Fan Control, which is a free system preference from Lobotomo Software. Visual chart shows the ramp up of fan speed based on CPU temperature.